Books used to be such rare and wonderful things. I’m not talking about centuries ago, either. During my school years, I felt awestruck every time I visited the large public library downtown. It was amazing to me that as an ordinary citizen—a kid, no less—I could walk in and borrow nearly any book, no matter how old, famous, or important it was. Searching through endless card catalogs seemed like a mysterious black art, and I was always slightly surprised to find that a book I was looking for was actually on the shelves. Wouldn’t everyone in the city want to read this? I’m equally amazed at the profound changes that have taken place in the last 20 years or so with respect to how people think about books. On the one hand, there seems to be an increasingly common assumption that all useful knowledge exists in digital form, or is at least catalogued that way. Where once a search for information would begin at the library, now it seems that’s the last place many people look—if it isn’t on the web, how important can it be? On the other hand, despite the ever-increasing numbers of books being published and mega-bookstores like Barnes & Noble and Amazon.com, the meme of borrowing books from a library has lost a lot of its vigor. You can order almost any book instantly with one click, and assuming you’re content with an ebook format, you can also start reading it instantly. For a certain segment of modern western society, going to a library for books is now seen as a sign of lower, rather than higher, class. Be that as it may, libraries remain the primary repository of a huge portion of the world’s knowledge, ready to be uncovered by seekers of all kinds. But there are libraries…and then there are libraries. Public libraries funded by taxes are a relatively modern invention, dating back only to the mid-1800s in the United States. Before that time, members of the general public who wanted access to a large collection of books had to pay for it. One common form of library required patrons to pay monthly or annual dues in exchange for access (which may or may not have included borrowing rights). When public libraries began to catch on, these membership libraries (also called subscription libraries) began to dwindle rapidly; I know of only 22 still functioning in the United States. 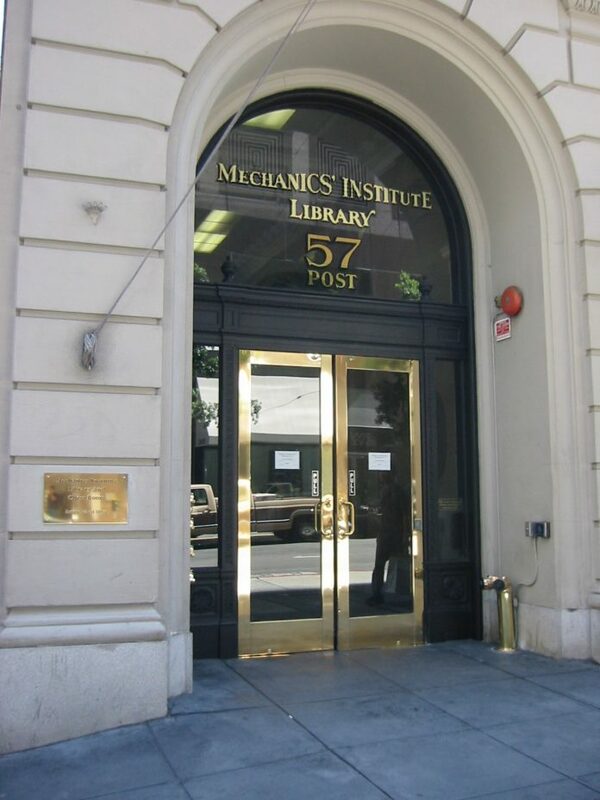 One such library is the Mechanics’ Institute Library in San Francisco, of which I was a member during the years I lived there. The library was founded in 1854 as an educational resource for “mechanics”—that is, anyone in an engineering or technical field—providing not just books but also classes, lectures, and cultural programs. By 1906, the library’s collection had reached nearly 200,000 volumes, but they were completely destroyed by the fire resulting from the great earthquake that hit the city that year. Within four years, however, a new building was erected for the library, and with a number of generous donations, it was back in business—this time, with a more general collection to appeal to a wider and less technically oriented audience. It also added a chess room, home to one of the oldest chess clubs in the country but available for use by all members. Today, the Mechanics’ Institute Library is still going strong, with an up-to-date and ever-expanding collection of books, periodicals, audio, and video; the obligatory Wi-Fi for patrons; and a popular series of cultural events. It was one of my favorite spots to do research, write, or just get away from the noise and chaos of the city. Why did I pay to go to the Mechanics’ Institute Library when there was a perfectly good public library in town that was much larger, closer to where I lived, and free? That’s a bit like asking why I’d eat at a small, out of the way, expensive French restaurant when there’s a perfectly good mall food court nearby. In other words: you get what you pay for. When I went to the Mechanics’ Institute, I knew that I would be walking into a clean, quiet, beautiful setting filled with great books—as well as intelligent and thoughtful people who, like me, care enough about the quality of their library experience to pay for it. Both patrons and staff take books very seriously—much more so, on average, than what I’ve seen in public libraries. Plus, for all my facility with internet searches, there’s still something deeply satisfying about finding a piece of information buried in a book or magazine on a shelf in a library. Membership in the Mechanics’ Institute Library is not terribly expensive, but it did give me a certain sense of power and status to be able to swipe my magnetic card and gain access to rooms full of books that most members of the general public have never even heard of. That makes those discoveries of information all the more rewarding. And there’s something else: reference librarians who are positively itching to help you find information. I always had to avert my eyes when I walked by the reference desk. If I made eye contact, I invariably got this guilt-inducing “why-aren’t-you-asking-me-where-to-find-old-periodicals” look, and I just couldn’t bear it. During the years I lived in Paris, I was a paying member of a similar institution: the American Library in Paris. Because that library specializes in English-language books, it met an important need for me that the French libraries, excellent though they are, could not. Membership libraries are somewhat of an anachronism; strictly speaking, no one needs them anymore, because there are other (and, usually, cheaper) ways of obtaining almost any kind of information you may want. Yet the Mechanics’ Institute, the American Library in Paris, and the few other institutions like it are, to all accounts, thriving nonetheless. In part, I believe it’s because they don’t just offer information; the seriousness with which they treat their books and their mission imparts a sacred sense of knowledge as power. That reminder alone is worth the cost. Note: This is an updated version of an article that originally appeared on Interesting Thing of the Day on July 3, 2003, and again in a slightly revised form on October 20, 2004.